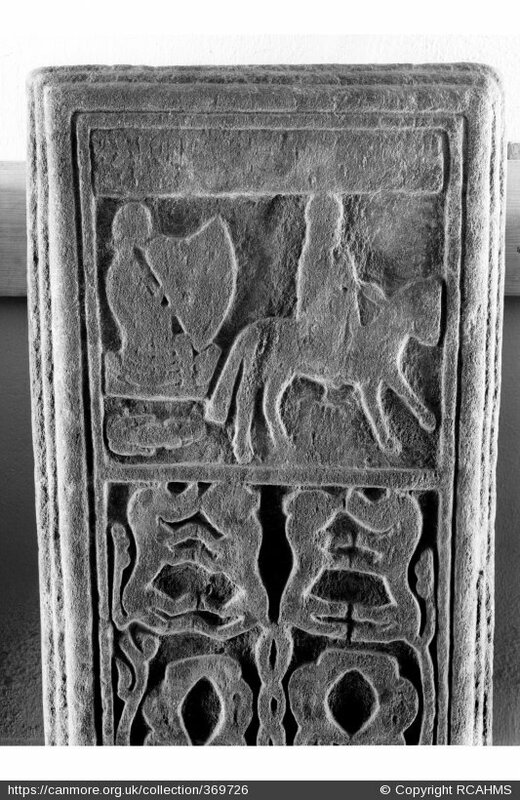 At the abbey of Iona there are a large number of amazing late medieval sculptured stone grave slabs. One of these slabs shows the figure of a harp player, a rare depiction of the playing of the Gaelic harp in West Highland medieval art. I know of only two other slabs with harps on them, from Keills chapel in Knapdale, and from Kilchoan burying ground in Glasphein, Skye. The stone, currently mounted on the wall in Iona Abbey cloister, was originally in Reilig Odrhain, St Oran’s Churchyard. The stone is carved in the “Iona school” of West Highland medieval art, which dates from the 14th or 15th century. There is a large number of similar carved slabs from the West of Scotland from this time, with a shared repertory of motifs and designs. The animals and the leaf shapes on this slab can be compared with the decoration on the forepillar of the Queen Mary harp. This stone has a depiction of a figure playing a harp, beside a horseman and also with what looks like the top view of a dog lying down. Beneath the figures is a group of 4 animals whose tails turn into a trellis of foliage. At the top of the slab is a panel containing an inscription, which is said to read “Hic iacet Nicolaus...” Steer & Bannerman1 suggest that Nicolaus is a Latin version of the Gaelic Cailean (English Colin). The slab was sketched by Edward Lhuyd in 1699-1700, who drew a lot more of the inscription than is now visible, but I would agree with Steer & Bannerman that Lhuyd’s sketch of the second line of the inscription seems nonsense. Previous commentators have described the harpist sitting in a little boat but to me this seems an unlikely interpretation. The lines beneath the harper’s body do not seem to match up with the lines beneath the base of the harp, and it looks to me more like the harper is sitting on a cushion, with the base of the harp resting on a stool. Or perhaps it is some kind of padded or canvas chair. I think that the boat idea has come from freehand sketches of the stone such as the one reproduced on the right. Below: Photo by the Royal Commission on Ancient and Historical Monuments. Used under license from canmore.org.uk.